It sounds to me like you believe slavery and slavery alone was the cause. Others have indicated that Secession and war was NOT monocausational. My question once again for the record was this: Who is it who gets to decide which cause was the primary cause among more than one cause? I don't believe it was more than one cause, as I posted in another response the concept of all the issues between the secessionists and who they seceded from is different from the cause of secession. Secession was a specific sentence for a specific crime... all other less important crimes against the South didn't warrant or cause secession. The best evidence is simply history, that until Lincoln was elected secession had never happened despite multiple political divisions. The specific context surrounding slave and anti-slave interests and Lincoln's election was the specific cause of secession. I think it's as simple as that. Do the Secessionists themselves get that privilege? Certainly when you are deciding why a group of people did something you would in fact look at what that group said they did it for. Especially when pretty much all key influential voices behind such an action speak along the same lines. 3. Believe they were wrong unintentionally... which leads to most of the same questions but instead of why they lied why they believed so wrong, of course you then must also prove why you have a more valid opinion on why they did what they did than the collective message of the secessionists themselves. I do not grant them quote the neutrality and objectivity you kindly bestow on them. I don't believe anyone was objective or neutral in that conflict. You are mistaken. You can disagree with the intentions of a historical group why still taking their collective message of why they did what they did as true. Most of these documents talked about high level motivations and interests... the entire event triggered by the 1860 elections. Each reference bring up different specific historical events leading up to it. I'm not sure what the purpose of what you propose would be. If you are looking for a primary cause of why a large group of influential people did what they did why would you not read their collective words on why they did what they did, their debates with each other while they did it, on when to do it, how to do it, and whether to do it. Then you determine whether there's a common message in that. You don't look at every little insignificant comment or detail in or missing. My response was solely about South Carolina, I quoted the official South Carolina commissioner sent to the Virginia Secession Convention. Might as well be the SC commissioner sent to these forums, to you. Do you have proof he wasn't a valid commissioner, that SC was wrong in it's official message of why it seceded through him? I'm curious why you would dismiss that official message giving slavery not only as the primary cause, but the only cause listed. He only listed 4 issues all tied to slavery. Had I been a Virginia listener to this speaker in 1861, I would have said to him the same words Jimmy Carter said about the later Virginian, Jerry Falwell, after Jerry attacked Jimmy over the Panama Canal, to wit, "You can go to hell --in a Christian sort of way." I don't completely disagree with you, though then again I suspect that commissioner probably had a better chance of having more personal insight into the situation than either of us do in the here and now. His words match countless other words regarding secession from secessionists. Such generalizations are common place, then, before, and even now. So you argue he overgeneralizes the North, I still don't see why I should believe you over him on why he and his State seceded, considering he was an official commissioner from South Carolina at the time. The Logic version of poetry. Well stated Matt. The only way it could have saved slavery would have been if the north caved in and acquiesced in the dissolution of the Union. But that would have involved a huge leap of faith on the part of the secessionists, who in their frenzy to leave the Union did not think the program out to a logical conclusion. "Just exactly how was it that Secession was going to preserve slavery?" How do James. Welcome to the Forum (forgive me if I'm mistaken, and we have crossed paths B4, but I think this is our first discussion). Are you saying you can't see how separating from one nation (where a quickly growing segment of society is ever increasingly coming to condemn slavery) and creating their own nation (dedicated to slavery) would preserve slavery? If we can, let's focus on this particular answer for a moment, and determine why it does not seem to satisfy you. Yes, a nice new nation without internal critics is a wonderful concept. How to create such a nation is another matter. The facts are that Secession did NOT create it. Please work on that word "How" and let me hear back from you. Once again. Secession eliminated the disruptive influences from Any Free States, as perceived by the slave owning oligarchy that governed the South as the cause of the political disruptions and crises under the United States Constitution. Its not that hard to grasp, the political leaders of the south had been trumpeting it since, at least, John C. Calhoun. Sorry, CW. No time for straw men. We don't have to guess, we know exactly how they planned to do it. Its the laid out in the Constitution of the Confederate States of America. Nothing could be more pointless than to suggest that the secessionists somehow thought their gimmicks would not work. They did work, after all, on so many of those poor average Joes in the South, who they foisted secession and war onto. And unlike the few Southern leaders who kept their heads, like Sam Houston, they of course didn't realize their plans were plumb crazy-dumb. Unfortunately for them, and those who followed them, those dang Yankees refused to play the roles the secessionists assigned them in their oversimplified, delusional Confederate play book: cower in the corner, or get their buts whipped, a la one Southron can whip ten Yankees. Guess they were used to dealing with doughfaces. So much for best laid plans. ...Here is the question: "Just exactly how was it that Secession was going to preserve slavery?" A trick question is it? I'm impressed that such a question grew any legs at all here. The common answer is so painfully simple and correct, long ago set in stone. But ok, let's labor through it: Southern slave owners felt that with Republicans and Lincoln taking office, slavery was on the road to extinction. Secession was then seen as the only way left to keep and expand slavery. That's it. If one is determined to overthink it, Southerners were inspired by Fire-Eaters to believe that the "ape" Lincoln could never be trusted in his claim that slavery would not be challenged where it already existed. Anyway that's almost beside the point, since slave plantation owners, those operating the primary business of the South and the only ones having any real political capital, well knew that that expansion was the only way to save slavery, period, at that point. The cotton lands were playing out. That's it. I think the enslaved made up about 57% of the population of South Carolina. The population had been Africanized between 1790 and 1846. There had been numerous bloody slave revolts in the Caribbean and on slave ships. Secessionists could capitalize the tangible physical powers of the enslaved men. The young men who would have to do the fighting could be destabilized by questioning their sexual power to possess white women. And the envy of the fast growing north, especially the greedy New York bankers, could further distract the men. The problem with all of that is that in the border states, the enslaved people were much more American, much less numerous, and had alternatives to revolution. In the border states, the men with money had relatives and associates in the northern states, and did not regularly see the northern people as a demonized entity. Secession satisfied a lot of needs in South Carolina, Mississippi, Louisiana and Texas, all of which had no deep seated affection for the United States. In the deep south people were more afraid of the slaves than they were afraid of the Yankees. In the border areas, there was substantial ambiguity on that issue. Great question. I can't wait to see the answers to this one. You are thinking logically. Consider that war is rarely the result of careful reasoning and thoughtful consideration of the possible consequences. I personally think that John C. Calhoun's statements that a state should not have to obey federal laws if the citizens there do not agree with them and his, to me bizarre, statement that slavery was beneficial for the enslaved, led people in SC in particular into thinking that was seriously out of touch with most citizens — especially in the North. Southerners tried to outlaw even talking about slavery in Congress. People who talk only with those who share their views can develop an "I don't know any rational person who has an opposite POV." Like cult members, they can come to see opposition as threatening. Isolating leads to demonizing those outside the group. (The same holds true for Northerners but you asked about Southerners.) Both sides seriously underestimated the determination of the other side. Realistic Southerners realized the disparity in population, industry, and immigration. They were pushed aside. Common boasts were that any Southern man could whip ten wimpy Yanks. And at the start of the war Southerners had more trained men plus shorter internal lines. Also, a great number of Southern religious leaders assured their flocks that the Almighty intended some to be masters and others to be slaves so anyone opposing the will of God could be expected to go down in inglorious defeat. It was not the thinking of planters or politicians that mattered. It was their beliefs. Does anyone have the statistics on the percentage of planters vs population. 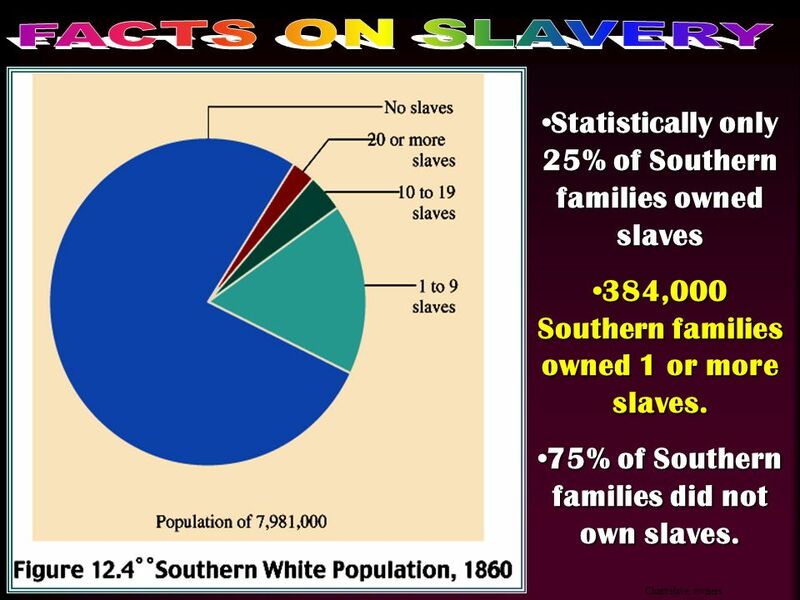 I read somewhere that only about 4% of the southern populous owned slaves. I am just getting in on this so forgive me if this has already been discussed. Was secession illegal or unconstitutional? 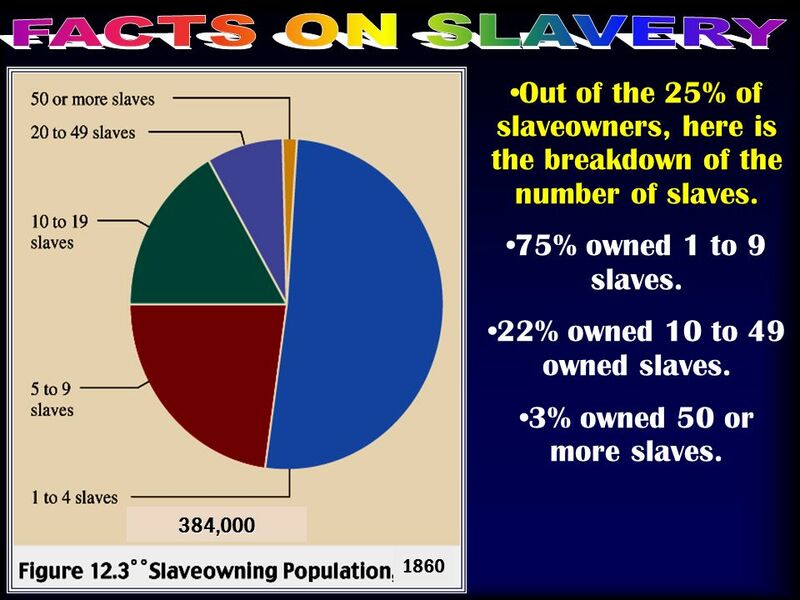 Plus if only about 4% of the population owned slaves how did this 4% have the influence that it did? 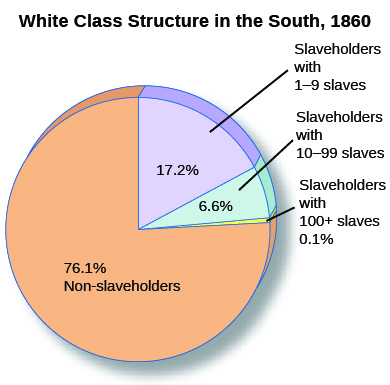 The actual number of southern slave owners was relatively small in comparison to the entire white population. However, that percentage increases when the statistic is given in terms of people in slave owning families. "The number that really matters is how many American households in the South had slaves," said Adam Goodheart, a Washington College historian and author of 1861: The Civil War Awakening. Joseph Glatthaar in his book "Soldiering in the Army of Northern Virginia" calculated that 19.9% of family groups owned slaves and that 24.9% of households owned slaves. There was quite a big variation between states within those numbers, for example: at the high end, in Mississippi 49% of families owned slaves, in South Carolina 46% did. At the lower end of the spectrum, it was 3% in Delaware and 12% in Maryland for families owning slaves. EDIT: @wbull1 You beat me to it! Regardless of the actual number of slave owners, be it individuals or families, the engine of southern economic prosperity was largely due to the cultivation of cash crops (cotton, tobacco, rice, sugar) based on enslaved labor. That's right and a significant proportion of slaveholder wealth was tied to the value of the slaves themselves. Secession was claimed to be illegal and unconstitutional in the United States. The seceded states no longer considered themselves in the United States so it didn't much matter to them. Today we seem to demand proof either way but it's to no useful purpose. There's no "right" or "wrong" to bluster over. None of us were involved. Whatever the percentage of slaveowners was (I suspect your source meant those slaveowners owning more than 100 slaves or something like that), it was they that drove the Southern economy, it was they that held the financial capital of the South. So simply "follow the money." It's no surprise at all why slaveowners had the influence they did.